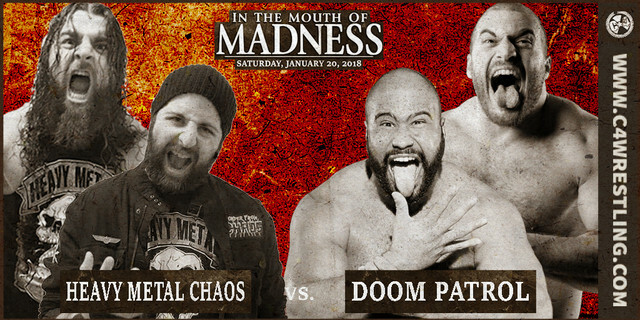 #C4InTheMouthOfMadness – Tag Team Championship battle! Chaos and Doom collide! Heavy Metal Chaos burst onto the C*4 landscape over the last twelve months, and in that time have become two times Tag Team Champions. The pair have been able to beat the dominating pair of Stu Grayson and Thomas Dubois, and then fan favourites, Fight or Flight, to win their pair of Championships. HMC has a unique combination of experience and strength that has proved to be a very tough to beat pairing. Well, at #C4InTheMouthOfMadness, HMC might have bitten off more than they can chew. Making their return, representing the lethal legion of Team Pazuzu… JAKA, and the “Dirty Daddy”, Chris Dickinson… The Doom Patrol! Now the question isn’t if HMC can retain. No, the question is now can HMC survive?! Both ticket types available NOW at the VENUE (Vanier Columbus Club, 260 McArthur Ave), and at VERTIGO RECORDS (193 Rideau Street, Ottawa)! ← #C4InTheMouthOfMadness – Double Main Event! Tag Team Dream Match! First event of 2018! #C4HEAT – Three-Way Tag Team battle! TDT vs. C2C vs. FoF”! #C4HEAT – “All Ego” tangles with the “Scrapper”! #C4HEAT – First time ever Tag Team dream match! #C4HEAT – Three-Way Dance main event! Former Champions Challenge “Walking Weapon”! Capital City Championship Combat (C*4) is Ottawa’s premiere independent professional wrestling organization. C*4 holds events regularly throughout the year featuring local competitors and top international talent from America, Japan, Mexico and more. C*4’s goal is simple – put on the best WRESTLING the Ottawa area has ever witnessed. Photos on this site are courtesy of Jason Barker.